The BRIESE Downlight is a focusable light source for direct and indirect illumination. The strong light output is not reduced by aids such as lenses. 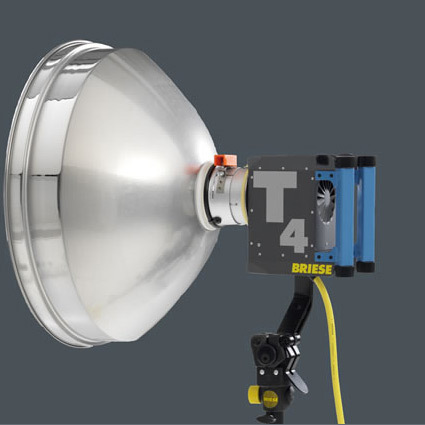 This light source is comparable to a Fresnel spot, but offers a far higher light output. The very narrow angle of illumination can be used for detailed reproduction of different materials as well as reflections and light curves. The optimum reproduction of surface textures is an extraordinary feature. The Briese Downlight is compatible with the H2 and H5 (2K and 5K Tungsten) lamp heads, as well as the 1.2K and 2.5K (HMI) T4 lamp heads.